1) Write out a schedule: A schedule can help you organize your time. 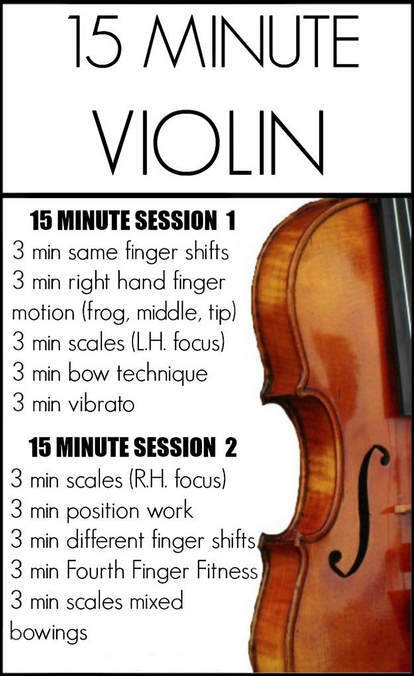 Be sure to allow time to review technical work (scales, arpeggios, tone & bowing exercises): the foundation of all the complicated things that come later. 2) Set goals: A schedule with goals can help you organize your thinking and chart your progress. If a certain task turns out to be really difficult and occupies too much time, break things up into smaller pieces – your goal should be to achieve results, not to cover material. 3) Concentrate: 10 minutes of focused practice is worth more than an hour of playing without results. Plan/work/see results and then walk away! You are building the skill of efficient practicing. 4) Relax and practice slowly: Take your time - donʼt rush through things. Start slowly and build up speed. Playing a small piece of music perfectly, even if it is slow is more valuable than playing through any music badly. 5) Practice hard things longer: Spend more time practicing what you canʼt do. Donʼt be discouraged, just look for ways to make progress: some things take longer than others - youʼll get it! 6) Practice with expression: Work the musical details into your playing, even when practicing slowly or in breaking things down into small pieces. 7) Learn from your mistakes: Don’t be too hard on yourself. If something goes wrong, analyze what went wrong and keep moving forward! 8) Be optimistic: Optimism helps you get over your mistakes and go on to do better. Develop your endurance while keeping a positive attitude. 9) View practice as discipline: Develop the discipline it takes to become good at something. That discipline is the real foundation of talent! The more you discover the relationships between things that at first seem different, the larger your view of your music becomes. In other words, your practice sessions can open up a whole world of possibilities.